$180 Refer a Friend Raffle! The more people you refer, the better your chances! For each referral that joins our Acute Weight Loss program*, you will be entered into a raffle for a chance to win four UltraMax Injections**, valued at $180. 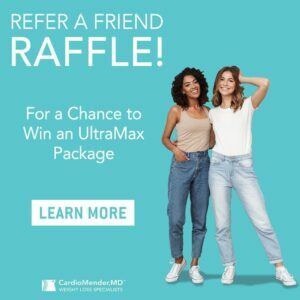 Additionally, as a patient of CardioMender, MD, you are always eligible for a $25 Referral Credit for recommending CMMD to friends and family. You will still get to keep the $25 Referral Credit for every one of your family and friends that enrolls. *New patient must enroll Acute Weight Loss Program by Thursday, February 28, 2019. **Must be a patient of the practice.